TOSS is a nonprofit organization which collects gently used school supplies for donation to students in need. The TOSS program is our vision for helping underfunded schools organize and support their students with the right tools to succeed in their education. It is our hope and dream for the future to see TOSS positioned in every community encouraging social responsibility and making a difference for students. Education is the bases for success in any society and The TOSS Program is providing students with the necessary tools to succeed in education. Hence, Tools Organize Successful Students is our acronym. 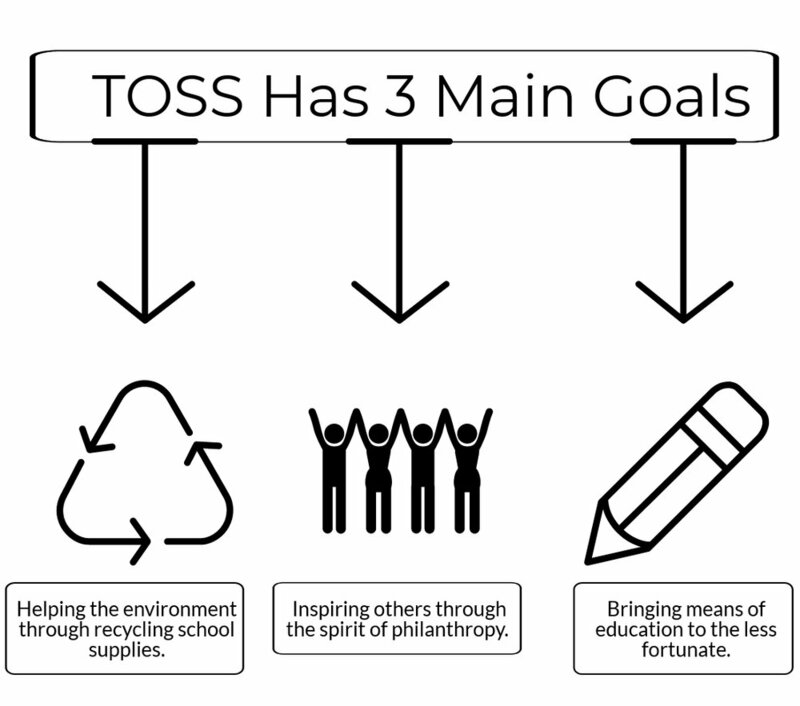 Our goal is to educate, celebrate, motivate, and inspire students to identify ways to spread the TOSS idea and to help schools in their communities by recycling the tossed out supplies to be used to their full length of life. With strategic partnerships TOSS is planning to expand nationwide. We know with your help and the sponsors help we can supply millions of children succeed. We believe: Tools Organize Successful Students. Since 2014 the amount of students receiving free or reduced lunch in San Diego has increased by over 1,700 students. In San Diego’s low-income areas, 30% of students are proficient in English and math, whereas 80% of students in middle to high-income areas are proficient in these subjects. These students are placed at a disadvantage in the classroom as their families do not have the economic resources to purchase school supplies. TOSS has changed the educations and lives of over 20,000 students in under five years. Our donations make a direct impact on the lives of these students and provide the tools for them to succeed in education. TOSS has changed the educations and lives of over 20,000 students in under five years.